Preschoolers will have super coloring fun with their favorite characters: Alpha Pig, Princess Presto, Wonder Red, and Super Why! 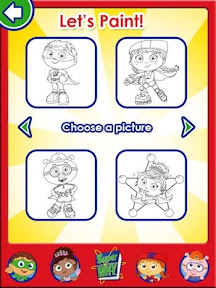 A combination of 48 coloring pages, a palette of 20 colors and 19 SUPER WHY themed stickers will keep kids entertained for hours. Using the app is easy! Simply start it up, tap “Let’s Paint” to select your picture and let the coloring begin. View the color selection by swiping your way through the color wheel at the bottom of the page. Make your selection, tap an object on the picture and the color appears. Voila! A masterpiece is done before you know it. Coloring just isn’t enough in this app and kids get to add a little something extra to their artwork. A selection of stickers are available to enhance the background on each picture. They may add as many stickers as they like and then remove the ones they no longer want with the help of the eraser. Each time a picture is created, kids have the option to save it to their own personal art gallery within the app. From there, they can export pictures to Photos allowing parents to share the beautiful works of art with family and friends via email, Facebook and MMS. Parents may also elect to use saved artwork as wallpaper on all their iDevices. Kind of like a high-tech version of refrigerator art. 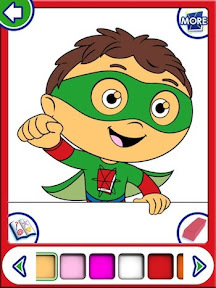 If your young kids enjoy watching the smart, exciting characters on SUPER WHY, this app is an excellent choice for them. Currently featured in New and Noteworthy, SUPER WHY Paint! is available for download in the App Store now for $2.99.